Yeah, I know hippies have a certain reputation regarding hygiene but I'm the "well-groomed hippie" so I consider daily showers and deodorant essential. As a pre-teen I started out using Sure antiperspirant spray because, well, that's what my mom had in the bathroom cabinet. I stayed with that until I developed asthma as a young adult and found that aerosols bothered me (and became aware of the environmental issues, as well). I switched to solid antiperspirants, usually Sure but occasionally other brands if there was a good sale. It really wasn't something I gave a lot of thought to. I read about the dangers of aluminum, which is the active ingredient in antiperspirants, and I knew I should do something different. I tried several different natural deodorants from the health food store and they were "okay" in the winter if I wasn't doing anything physical but honestly, they just didn't cut it. I kept going back to the commercial antiperspirants. Then a few years ago I heard about using baking soda. After my shower I would pat some on like you would powder. It was effective against odor but it irritated my freshly shaved armpits, sometimes a LOT. Ouch. I use coconut oil for a lot of things so I decided to mix it with the baking soda. Perfect. No more skin irritation. Until recently I just kept two separate jars in the bathroom, one with coconut oil and one with baking soda. 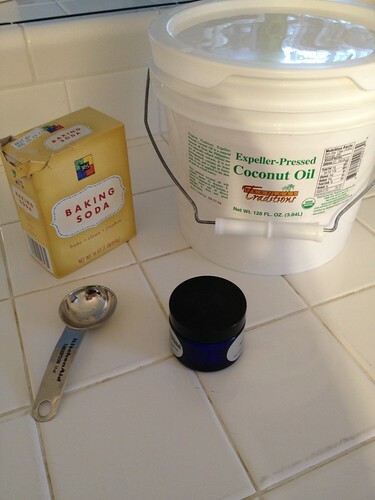 I would scoop a little coconut oil into the palm of my hand, add a pinch of baking soda, rub together and then apply. Before one of our vacations I decided I would mix the two ingredients so I'd have one less jar to pack. Either way works fine, though. If you Google "baking soda and coconut oil deodorant" you'll find plenty of recipes with exact quantities and oftentimes including other ingredients such as cornstarch or arrowroot powder. I just keep it simple, though. Melt some coconut oil in a glass jar. I use the refined version which has no coconut smell, plus it's cheaper. When completely liquid, add baking soda. How much? Well, if you follow my cooking blog, Dee's Kitchen, you're already familiar with my tendency to avoid precise measuring. I'd say perhaps half as much baking soda as coconut oil. You might need to experiment to see what proportion works best for you. In fact, I'd use the two jar method for a little while first so you get a sense of how much baking soda you need. And you might need a little more in the summer or if you exercise a lot. 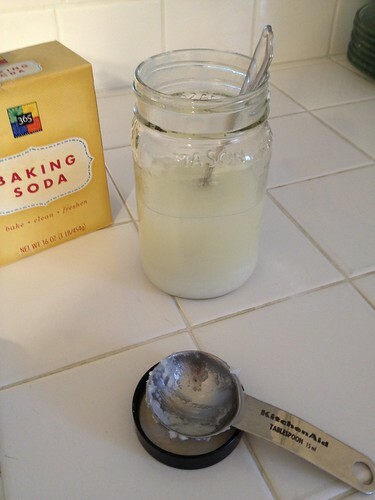 After adding the baking soda to the melted coconut oil, mix well and then pour into whatever container you plan to use. I have saved a few of the glass jars that my moisturizer comes in. Now, what about the fact that this isn't an antiperspirant? It will prevent odor better than anything on the market but it won't prevent you from perspiring. That's actually healthier but I do understand that some people perspire a lot and if you have to wear a dress shirt to work or are wearing a silk dress to a wedding that can be a problem. All I can say is that everyone has to decide what works for them. Hey, I still dye my hair so who am I to judge? But I do think it is worthwhile to decrease our exposure to chemicals as much as possible so I would suggest using the homemade version in the winter, or at home when you're not wearing any special clothing. Keep your usual antiperspirant for when you need it. At least your overall exposure will be decreased and I think that's a good thing. 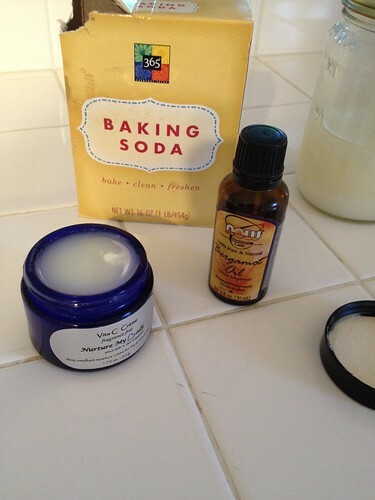 I normally just use baking soda mixed with tea tree oil and lavender. I add lotion if needed. 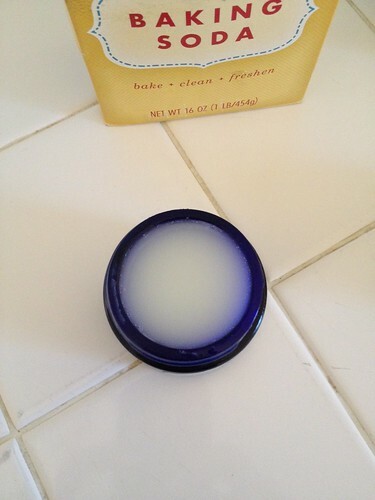 It's a very cheap and easy deodorant and doesn't stain your clothes!